We are delighted that OM-C has been extremely successful in its application and has been appointed by the NHS to provide support to 7 lots of the Health Systems Support Framework. We believe that the detailed process of delivering primary care and community orientated population health management and a new kind of NHS contract can reverse the pattern of the past and can in fact bring communities and all staff together around a common goal of better, fairer health outcomes delivered more effectively and efficiently than ever before. The values of OMC align closely with the NHS because we share its long-term commitment to create a stable system based on enabling healthier lives. We have an extensive track record of working with GPs and all parts of the NHS. By contrast with most of the companies and consulting firms on the framework that are not able, or do not wish to, commit to equity partnerships with new integrated care providers, we can, and we will. For the last two years, OptiMedis-COBIC UK has brought together the expertise and experience of two well established and pioneering companies, OptiMedis AG from Germany and COBIC Ltd from the UK, working in close association with NHS Commissioners and Providers, as well as leading IT companies and academic partners. Dr. Oliver Gröne, Vice Chairman of the Board, OptiMedis AG, talks about "The proliferation of Accountable Care models – an inside perspective into the black box of a shared savings contract”. Amsterdam, the Netherlands – Royal Philips (NYSE: PHG, AEX: PHIA), a global leader in health technology, together with its consortium partners including OptiMedis AG, today announced that it has received 15 million € funding from the EU’s Horizon 2020 program to pilot big data solutions to achieve better patient outcomes in healthcare at a lower cost. OptiMedis-COBIC UK is excited to announce that we have won a bid, in partnership with Cerner, NEL CSU and Imperial College Health Partners (ICHP) to provide a new performance and population health management dashboard for NHS England and Integrated Care Systems (ICS) across the country. The Training Network HealthPros is looking for Early Stage Researchers with a master degree in a relevant discipline and who are interested in combining qualitative and quantitative research methods. OptiMedis-COBIC UK ltd (OM-C) was set up exactly a year ago, reason enough to reflect on progress to date! What is OM-C? 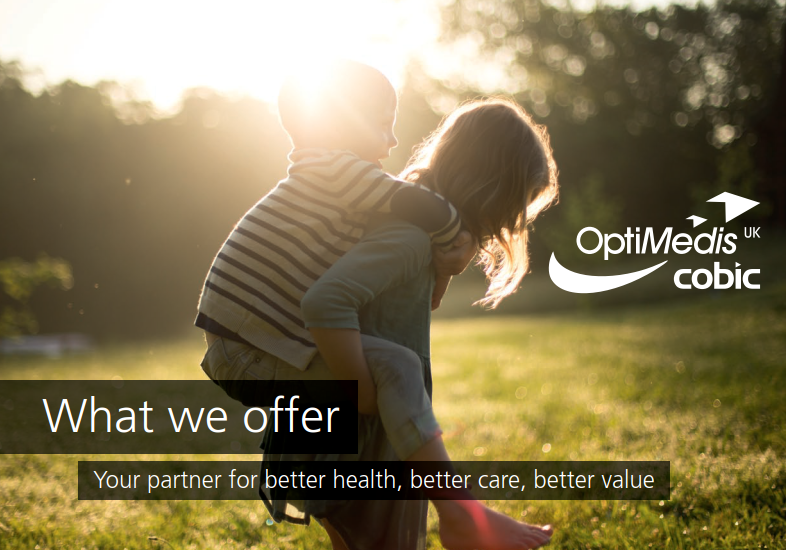 OM-C brings together the expertise and experience of two well established and pioneering companies, OptiMedis AG from Germany and COBIC Ltd from the UK, working in close association with Imperial College Health Partners (ICHP), the Academic Health Science Network. On 8th November, the consulting arm of COBIC, a consulting partner of OptiMedis-COBIC UK, was awarded a place as member of a consortium of value driven expert consultants on a prestigious government framework of pre-qualified providers. The following press release provides more information. In August 2017 OptiMedis-COBIC UK were appointed as part of a consortium to support the 40 practices and other health and care organisations to develop as an Accountable Care System to serve the 200,000 people of Fareham and Gosport, Hampshire. Copyright © 2019 OptiMedis-Cobic UK Limited. All Rights reserved.